Just came across this future release on Amazon and it sounds like it might have some promise! What do you think dear reader....does it pique your fancy? Tides of War opens in England with the recently married, charmingly unconventional Harriet preparing to say goodbye to her husband, James, as he leaves to join the Duke of Wellington's troops in Spain. 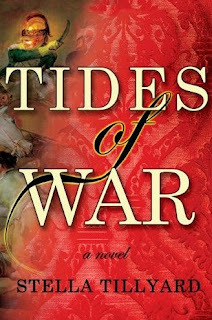 Harriet and James's interwoven stories of love and betrayal propel this sweeping and dramatic novel as it moves between Regency London on the cusp of modernity—a city in love with science, the machine, money—and the shocking violence of war in Spain. With dazzling skill Stella Tillyard explores not only the effects of war on the men at the front but also the freedoms it offers the women left behind. As Harriet befriends the older and protective Kitty, Lady Wellington, her life begins to change in unexpected ways. Meanwhile, James is seduced by the violence of battle, and then by love in Seville. Ooooh, sounds good. There are just TOO many good books. Sounds very good. Thanks for the update. All of these books sound so wonderful and I'm sure they're just chock full of history that I absorb like a sponge. Would love to sit down with all of them right now and read away! "Where credit and financial speculation rule"--sound familiar? Oil companies making record profits yet raising the price at the pump: I bet something equivalent was happening in the time era of this book.